The Mpesa appeal with .africa gTLD for the unbanked! With the dynamic influence in which the digital technology is growing, its clear that the world is heading to the mobile platform. History of tech trends shows that people and organizations and consequently manufacturer of tech –consumer products have fast moved from stationery PC’s to the portables, this were mostly laptops. With the recent exiting move to the mobile platform, tablets and phablets (a hybrid of phone and tablet) laptops are being quickly ditched for light hand held devices. App developers across the platforms that include HTML 5, Android, BlackBerry and IOS are increasingly developing apps that are used by the hand held devices. In Africa its reported that it’s the largest user of the mobile platform, Opera which is the owner of the opera browser recently gave a State of the Mobile Web in June 2012 report that of essence saying “to growth in mobile web browsing, few regions in the world can compare with Africa.” “were over 200 million Opera Mini and Opera Mobile users” this emphasizes the switch to mobile devises that is inevitable. One of Africa’s most brilliant innovations on the mobile platform is the Mpesa mobile transfer that started off as a money transfer platform but has eventually grown to provide services that equal that of a debit/credit card. Its being used for virtually all classes of people in paying bills and sending money across the divide. Bill gates in appreciating this incredible innovation that has changed Africa and is being implemented all over the globe said “Consider the example of M-Pesa, Kenya’s mobile-banking service that allows people to send money via their cellphones. M-Pesa first needed to invest in many brick-and-mortar stores where subscribers could convert the cash they earn into digital money — and back into cash. 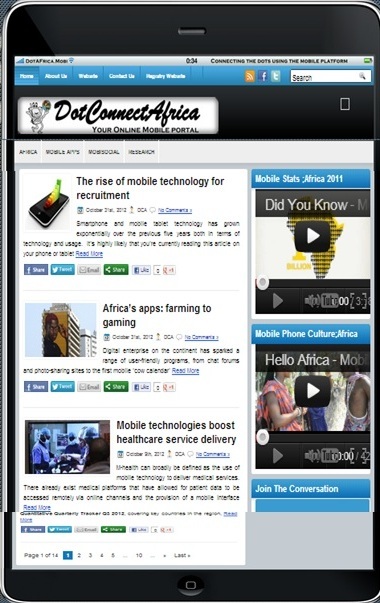 In the most interesting development that we shall be keen to watch when its rolled out, DotConnectAfrica an applicant of the .africa gTLD string during the ICANN new gTLD program have already announced an ambitious program in partnership with Safaricom the largest telecom firm in East Africa that will enable them to sell the .africa domain names to everyone through the mobile platform, it will be interesting to see the uptake since mobile technology is truly being embraced especially in the African continent who are waiting to start using a dotafrica.mobi, a recent DotConnectAfrica announcement, that intends to integrate mobile features and apps in this platform. The proliferation of the mobile money has also influenced how other services may be provided, this has leveraged other fields such as digitally-enabled health care, or mHealth, which though is one area that has been slow to emerge because it is difficult to build a great platform and then convince everybody in a health system that it is worth using. Others include mCow that offers farmers mobile enables dairy services. With these technologies being implemented on the mobile it will be interesting to see how the world will finally be entirely mobile doing everything on the go.